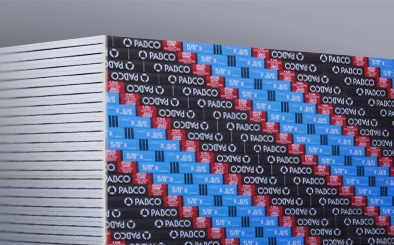 PABCO ABUSE CURB® Type X is composed of a fire-resistant, non-combustible gypsum core that incorporated MOLD CURB® PLUS technology. ABUSE CURB® is the solution for situations where abuse-resistance, mold-resistance and water-resistance are needed. The core is encased in 100% recycled heavy mold and water-resistant paper facing and backing.